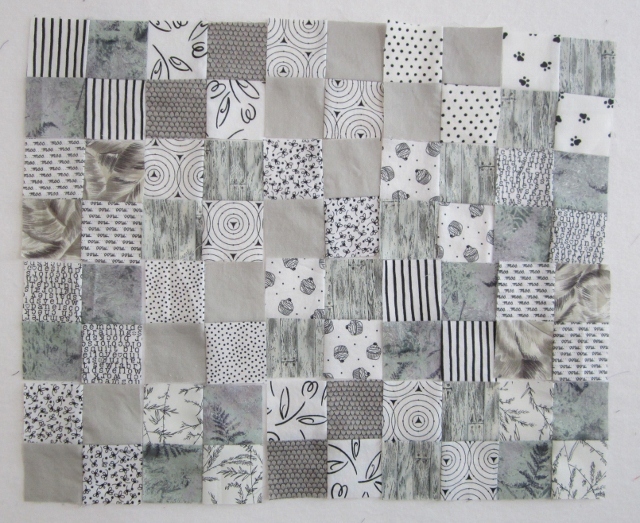 I have started Bonnie Hunter's Easy Street Mystery quilt. I did Orca Bay last year but it is not finished yet. I hope to work on Easy Street and finish my Orca bay over the next year. 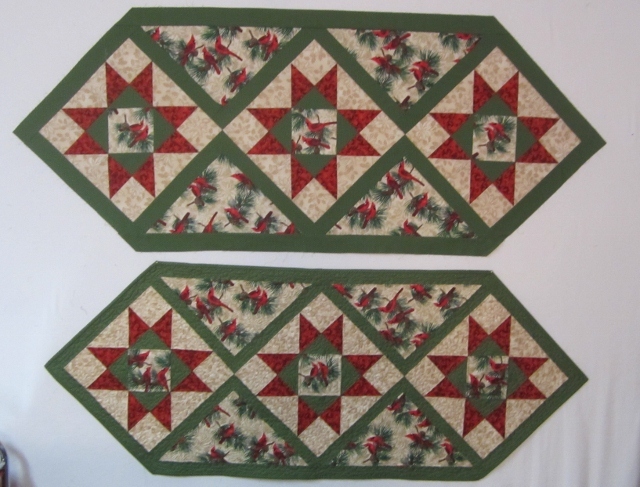 These are the four patches using 2" strips of fabric. I love these little squares. I believe I got 200 done, a few extras in case I lose some. 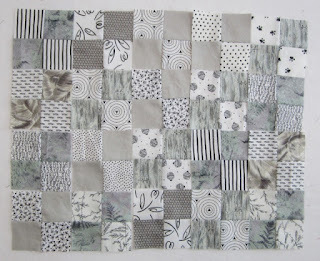 I have linked up to Bonnie's Easy Street Linky Page and Patchwork Times Design Wall Monday. I also have my second table runner top done. The top one is not quilted yet. But I can give the finished one away this weekend at the dog trial and know I can keep the other one. I am very very close to running out of the green. I believe I have enough to finish the binding for the second one then that will be it for the green. Talking about dog Trials, I thought I would go to Regionals for the Agility Associations of Canada (AAC) this June 2013. While I planned to go but the good news is it will be close to home. Yes! Then I found out Nationals will be in Leduc (Aug 1-4,2013) my town, on the soccer fields were my boys play soccer. I want to qualify now for Nationals. If I do not make it I will help and watch good dogs. But I never dreamed of going to Nationals, thought it would be out east this year. I can hardly believe I have a small chance of going to Nationals. I just started competing last year. Hey, Cathy! Here we are again, quilting into the Mystery. :-) Like your greys and B&W. I didn't have much of either but lots of creams and blues, so went with that combo instead. It will be fun to see how this plays out. great news for you and Lex! 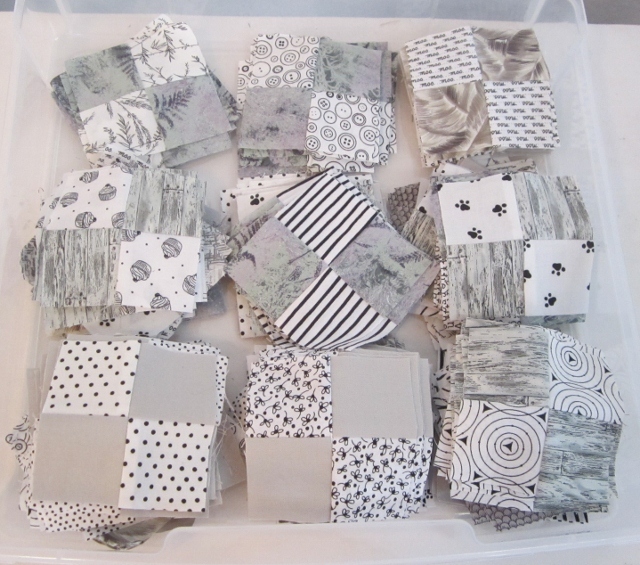 Keep plugging along with Orca Bay and those are Happy little 4 tops are ready for Step 2. I really like your grey with the black and white, it is so much softer than my black although I love them too. It will be interesting to see how these play with the other colors as we move on. I have about 150 done I think. May be able to finish tomorrow night. Lovely little four patches, will be exciting to see this evolve. You have a very good looking set of 4-patches there! Looking forward to step 2. 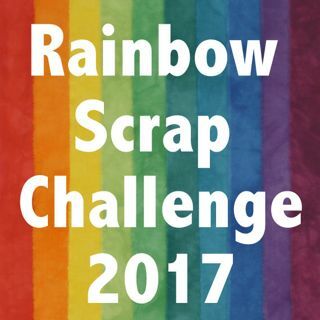 So fun to see the fabrics people used! What a great variety you have!